The holidays are notorious for ruining fitness goals. From fruit cake and pumpkin pie to honey-glazed ham and deep-fried turkey, there’s temptation everywhere you turn. This year, don’t give in! We’re committed to helping you reach your goals, so we put together 10 tips to keep you away from the table and avoid overeating. Tip #1: Practice the art of grazing. When you’re hungry, you tend to overeat. When you overeat, you feel full, but the sensation doesn’t last. Don’t fall into the trap. Instead of eating three large meals, eat mini meals in between. By doing this you’ll notice that you have more energy and it takes less food to make you feel full. Almonds, sunflower seeds, and passion fruit are all smart choices. Did you know that your body confuses thirst and hunger as the same thing? For example, you may think that you’re hungry, but in actuality you may just be thirsty. When you find that you’re hungry, put it to the test and drink a glass of water. Normally, drinking a glass of water will pacify your perceived hunger. If the idea of drinking water bores you, try our Liquid Water Enhancers™! Each supplement comes in two delicious flavors. Tip #3: Stop drinking liquid calories. Another sneaky culprit that contributes to unnecessary weight gain is one that’s often overlooked. Juices, sodas, and flavored drinks are loaded with sugar. Stick with water instead, or, if you’re in the mood for something sweet, try Best BCAA™ Soft Drink Series. Choose from four delicious, lightly-carbonated flavors: Root Beer, Cream Soda, Orange Soda and Grape Soda. Each one tastes like a classic soft drink—but won’t derail your nutrition plan with a lot of sugar. Tip #4: Eat for hydration. Did you know that foods with a high water content, like fruits and vegetables, are absorbed more slowly in your body? Your body takes such a long time to digest them, they make you feel full longer. The next time you’re invited to a friend’s holiday dinner, eat an orange, tangerine, or strawberries before you arrive so you’re less likely to overeat. If you prefer vegetables, you can also load up on broccoli, celery, cabbage, or carrots. Tip #5: Learn to relax. Carrying excess stress is debilitating to your mind, but it can also affect your waistline. Many people tend to eat more when they are overstimulated by stress because of cortisol, a hormone that’s linked with fat gain. But, when you practice effective coping techniques, such as working out, it lessens your chances of overeating. Cardio and lifting weights alleviate your levels of stress by increasing endorphin levels, your brain’s feel-good neurotransmitters. Tip #6: Don’t go to a party hungry. Never go to a food-oriented event when you’re hungry. If you don’t follow this advice, you’ll definitely overeat. Instead, make sure to eat a snack before you leave. While you’re there, try to limit the number of hors d’oeuvres you indulge in. Tip #7: Start each meal with a soup or salad. 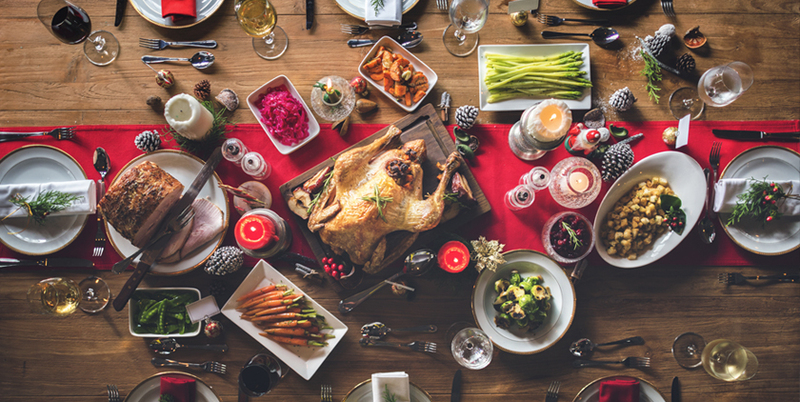 Unlike regular meals, holiday food tends to be richer and heavier, which contributes to excessive caloric intake. It’s easier for you to eat a small portion of a holiday meal without feeling hungry if you start off with a broth-based soup like minestrone, vegetable, or chicken noodle. Starting your meal with a small salad can also help curb your appetite, so you won’t be compelled to overeat. Tip #8: Get a good night’s sleep. According to studies, the psychological effects of sleep deprivation and hunger are so similar that you cannot differentiate between the two. For example, if you’re sleepy you may feel compelled to snack on a late-night meal instead of going to bed. Research also shows that people who don’t get enough sleep are more likely to have bigger appetites. After you swallow your food, it takes between 10 and 30 minutes for you to feel satisfied from it. This delay is one of the main culprits behind overeating. Thus, it’s important that you chew your food very slowly. In fact, experts recommend counting slowly to 10 in your mind while chewing, which will help you savor each bite. Following this simple rule will cause you to eat more slowly, allowing your mind to catch up to your stomach. The faster you eat, the more you’re likely to consume, particularly later in a meal. Tip #10: Practice portion control. Size does matter. Practicing portion control is the easiest way to prevent overeating. You can use your hand as a trusty measuring tool by following the easy guide below. Use your palm to determine your protein portions. Use your cupped hand to measure your carbohydrate intake. Use your fist to determine your serving of vegetables. Use your thumb to measure your fat portion.